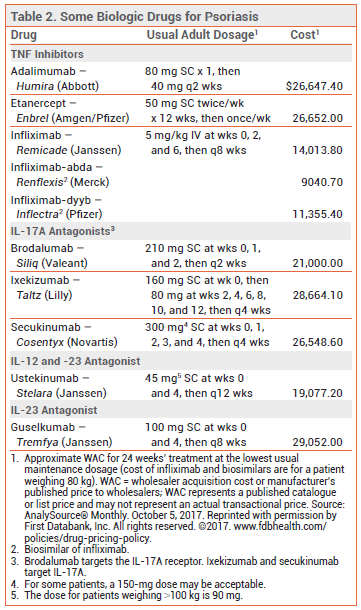 Guselkumab (Tremfya) for Psoriasis | The Medical Letter, Inc. ADVERSE EFFECTS — In clinical trials, tinea infections and hepatic enzyme elevations were reported more frequently with guselkumab (1.1% and 2.6%) than with placebo (0% and 1.9%). Serious infections, including fungal infections and reactivation of tuberculosis, have occurred in patients treated with the drug. Antibody formation has been reported with use of guselkumab; whether it reduces the effectiveness of the drug is not known. PREGNANCY AND LACTATION — No data are available on the use of guselkumab in pregnant women. Whether guselkumab is present in human breast milk is not known, but human IgG antibodies cross the placenta and can be found in breast milk. DRUG INTERACTIONS — No clinically significant drug interactions have been reported with use of guselkumab, but blocking IL-23 could affect formation of CYP isozymes and metabolism of CYP substrates. Patients being treated with guselkumab should not receive live vaccines. CONCLUSION — The IL-23 blocker guselkumab (Tremfya) appears to be effective and generally safe for treatment of moderate to severe plaque psoriasis. In one clinical trial, it was more effective than the TNF inhibitor adalimumab (Humira). In another trial in patients whose disease had not responded to ustekinumab (Stelara), guselkumab was more effective than continuing ustekinumab. How guselkumab compares to other drugs for this indication remains to be determined.